PHARR - A long line of trucks wait to cross the Pharr International Bridge in this 2016 photo. PHARR — In an effort to diversify an already robust Pharr-Reynosa International Bridge revenue stream, the bridge will collect tolls from trucks that pass through the bridge and the toll road connecting the city and the Port of Brownsville. The Pharr City Commission approved on Monday an interlocal agreement with the Cameron County Regional Mobility Authority in order to make this happen. This new toll collection on State Highway 550, which will begin imminently, will bring about $33,000 per year to begin with, and potentially increase from there, according to Bridge Director Luis Bazan. “It makes sense with all the produce, oil and gas, everything else that goes to the port,” Bazan said. The bridge, which is the top produce port of entry in the country, brings in roughly $12 million annually. Pharr is a full-service bridge that crosses fully loaded and empty trucks, as well as passenger vehicles. Another agreement the bridge is working on with the Port of Brownsville is a Memorandum of Understanding that would make it so a large swath of the trucks crossing the bridge and using the port would just use the Pharr Bridge and the Port of Brownsville, as opposed to a bridge in Brownsville or Laredo. However, that was not an item on Monday’s agenda. Conversations are ongoing between the bridge and the port. These crossings favor trucks that service northwestern Mexico. While the bridge is attempting to ramp up revenues, wait times continue to plague the bridge, especially as a Mexican construction project is under way on the Reynosa side of the bridge. The Anzalduas International Bridge, located in Mission but owned by McAllen, Mission and Hidalgo, has tried to cut into that. 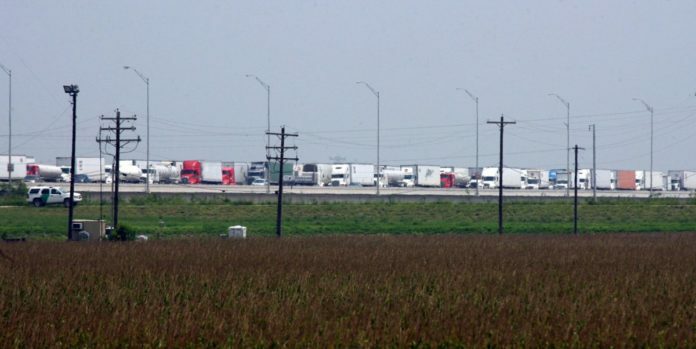 However, the Anzalduas only crosses empty trucks southbound and, while steadily increasing its numbers, has not made much of a dent into Pharr’s crossings count. Part of the problem for Anzalduas’ southbound crossings is that Servicio de Administracion Tributaria, the Mexican equivalent of Customs and Border Protection, does not begin work on the Mexican side of the Anzalduas until 3 p.m. Empty trucks cannot begin crossing southbound at the Anzalduas until 3 p.m. Meanwhile at the Pharr Bridge, SAT varies inspecting different trucks depending on the day. On weekdays, SAT begins inspecting empty trucks at 7 a.m. and fully loaded trucks at 8 a.m.